Info: Created on 20th November 2009 . Last edited on 5th April 2010. Totally agree with aphoria. This is awsome. Clean, a bit technoid, and far more original and well crafted than most of the generally ugly paperclip fonts. Good work. 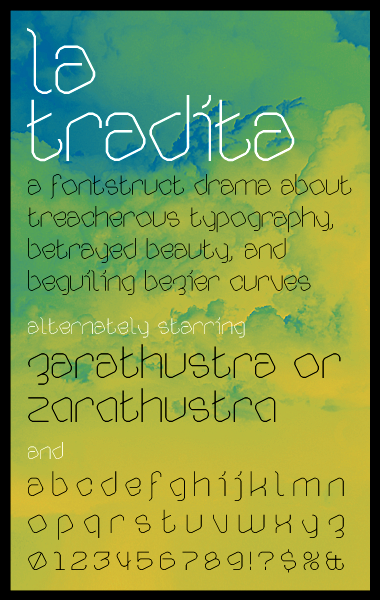 The sample confirms, Tradita is a beauty ! Sometimes it is a good thing to let our own rules evolve ! A very readable and characterful design. The welcome on the dark side sure is cordial... ;) Thanks for the comments, glad you like it! I totally agree with neurone error and funk_king that we shouldn't be too stubborn about our own rules, and that we should let them evolve sometimes... Especially if they're only based on stupid perfectionism that keeps us from doing something great just because it's not 100% perfect. I guess the reason why I have so long refused to do bezier-fakes here is because I think it's a pity to see so many great ideas that really deserve to be professionally executed in a "real" font design program struggle their way through the grid. I always wanted my fonts to be 100% usable and complete, not only second-best concept sketches describing what I would have wanted it to be if I was able to do them with professional software. Which can be pretty hard with the restrictions of the grid. And I was afraid that the satisfaction of getting good feedback with "grid sketches" alone would satisfy me enough to lose the drive to learn a "real" font design program someday to do "perfect" executions of those ideas. Congratulations! FontStruct Staff have deemed your FontStruction worthy of special mention. “Tradita” is now a Top Pick.